Having a warm bowl of oatmeal in the morning is one of the best breakfast options. Whether you have it blended with fresh fruit or eat plain, you will end up getting some amazing health benefits. It provides you with loads of fiber and other nutrients that improve your health in more ways you might imagine. Let's find out about some reasons to eat oatmeal for breakfast. Eating oatmeal for breakfast is not only a timesaving option, but it also provides you with a variety of health benefits. As you get loads of fiber from oatmeal, eating it for breakfast will help keep you full longer. If you eat something high in sugar and fat, you will feel full for a short period and have to deal with hunger pangs. This can make you eat unhealthy stuff that is directly going to affect your body weight. A breakfast smoothie, consisting of fruit, oats, and ice can keep you from feeling hungry and help control your weight. One of many benefits of oats comes from its high magnesium content. Your body needs magnesium to produce energy and keep your heart healthy. It dilates blood vessels and improves blood circulation. This way, it supports the heart muscle and keeps blood pressure from going up. Moreover, your body requires magnesium to use glucose properly and regulate insulin secretion. Oats contain a compound called lignan, which is beneficial for your heart, but it also lowers your risk of developing hormone-related cancer, like prostate, breast, and ovarian cancer. That is why oats are equally beneficial for both men and women. Regular intake of oats can help stabilize blood sugar levels, and this in turn can significantly lower your risk of type-2 diabetes. Even when you have diabetes, you can still include oats in your diet. It contains complex carbs and is high in fiber, which is why it will not lead to a quick spike in your blood sugar levels. It is important to note that oats contain a special type of fiber called beta-glucan that converts into gel during digestion process. Your body takes longer to digest food in this case, ensuring you do not notice any dramatic rise in your blood glucose levels. One of many benefits of oats is that it can help lower the bad cholesterol (LDL) levels without changing the good cholesterol levels. By lowering your cholesterol levels, you will be able to save yourself from heart disease. Lignans in oats also help keep your heart healthy. 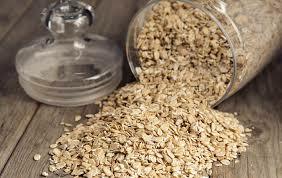 Again, the insoluble fiber in rolled oats helps improve your digestive system. The fibers found in oats scrub through the intestines and help move food along to prevent constipation. If you already have constipation, eating oatmeal for breakfast can help treat it. You also benefit a lot from rolled oats if you are currently struggling with gastroesophageal reflux disease (GERD). It is not high in fat, so it helps to control heartburn and other GERD symptoms. So many problems can result in hair loss. It can happen due to harsh chemical treatments, alopecia, unhealthy lifestyle, and hormonal imbalance. Sometimes, you experience hair loss because your diet does not include enough of essential vitamins and minerals. Including oatmeal in your diet may help because it provides you with iron, zinc, potassium, and magnesium that promote hair growth. You can also get a good dose of vitamin-A, vitamin-C, and other nutrients by combining oats with pumpkin and berries. A vitamin C deficiency can cause a disease called scurvy that can also lead to hair loss. One of many benefits of oats is that it helps remove the dead skin cells and keep your skin healthy. The presence of beta-glucan in oats makes them beneficial for your skin. The nutrients in oats penetrate deep into your skin and beta-glucan creates a fine film on the surface of your skin. This provides deep moisturizing to your skin. Using oats may help with wound healing and shallow abrasions. Simply mix two cups of oats, a cup of milk, and a tablespoon of honey. Apply this mixture to your skin to enjoy amazing benefits. You will be in a better position to fight infections when your immune system is functioning properly. Oats can again help you with this. Loaded with vitamins, such as riboflavin, thiamin, vitamin B6, niacin, vitamin K, vitamin E, and folate, oatmeal works amazingly well to strengthen your immune system. Your body uses vitamin-E to break down complex lipid compounds, whereas vitamin-K is essential for red blood cells and good bone health. Vitamin-K also lowers your risk of developing diseases like Alzheimer's disease and cancer. How Much Is a Gram of Coke?